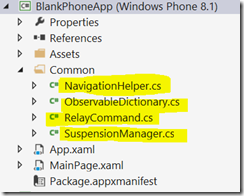 I’m more than prepared to admit that I find the way in which navigation and state management are done in a Windows/Phone XAML application to be “a bit confusing” and so I thought I’d write down some thoughts here both in the interests of reminding myself in the future and maybe helping out somebody else who’s looking at the same thing. 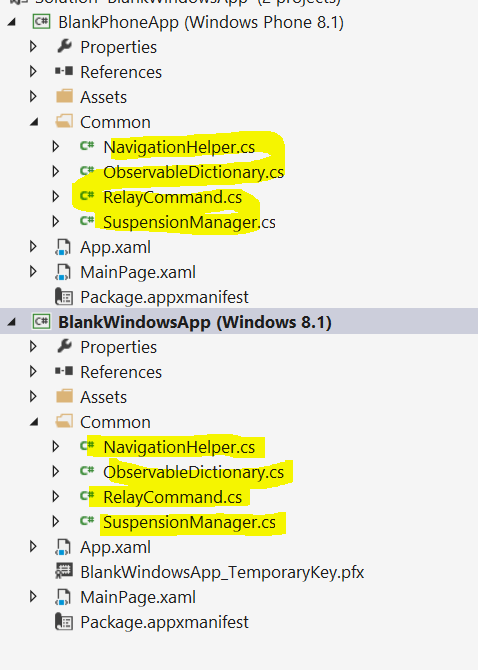 I have to keep reminding myself because I wouldn’t necessarily write an app using these mechanisms myself but they do ship in the box with Visual Studio so, frequently, I find myself talking to other people about them or looking at code that uses them. and the blank application template doesn’t include classes like NavigationHelper, SuspensionManager whereas the other 3 templates do. However, those other 3 templates come with a lot of pieces that might be more than you really want and so you have to do work to take out all the sample data and that kind of thing. 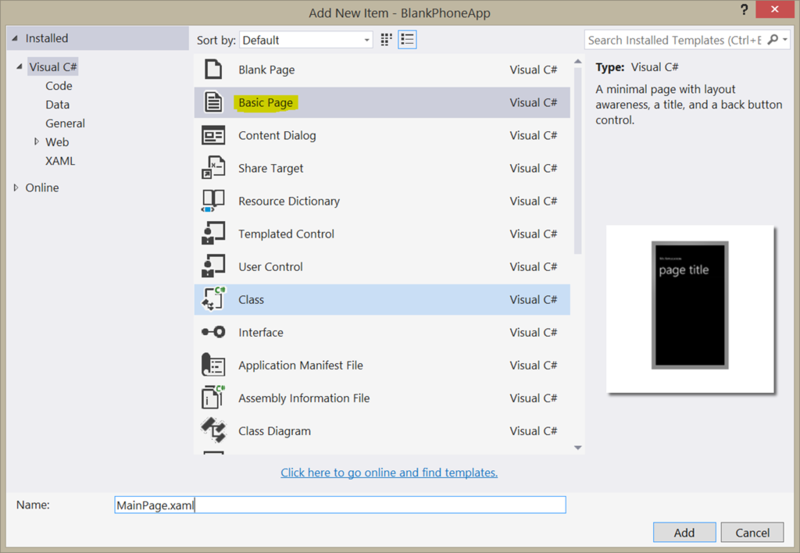 What I do is to create a blank application. 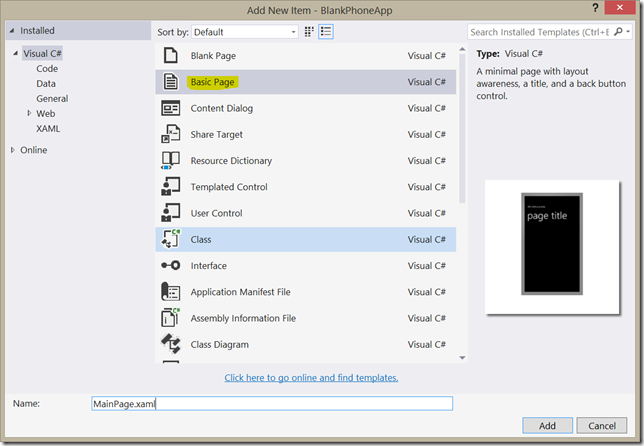 For this post, I am starting with a “Blank App” for Windows and a “Blank App” for Phone and I’ve added them both into a single solution. In one of these Windows/Phone apps you have a UI which is sitting in a Frame UI control and that Frame knows how to Navigate between Pages. 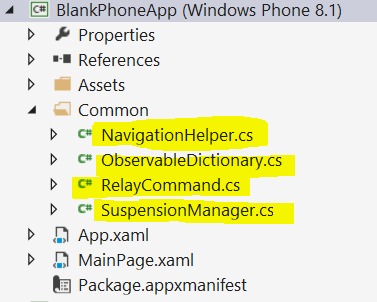 Unlike Windows Phone 8.0, it’s possible in Windows/Phone 8.1 to have more than one Frame in an application with each one having a separate navigation history. That said, I’ve almost never seen anyone do that and so (for me) it adds some complexity that’s rarely used. In the templates that we’ve used to create our app, the Frame will be created in the override of Application.OnLaunched with code that takes a look at the Window.Content property and creates the main UI if it’s not found in that Windows’ Content. For me, this is kind of “ok” but it doesn’t indicate that there are scenarios where we might need to create our application’s UI outside of the OnLaunched override and so, generally, I’d prefer to factor this code out of this function but for this post I’ll leave it there to avoid adding more confusion. // Removes the turnstile navigation for startup. 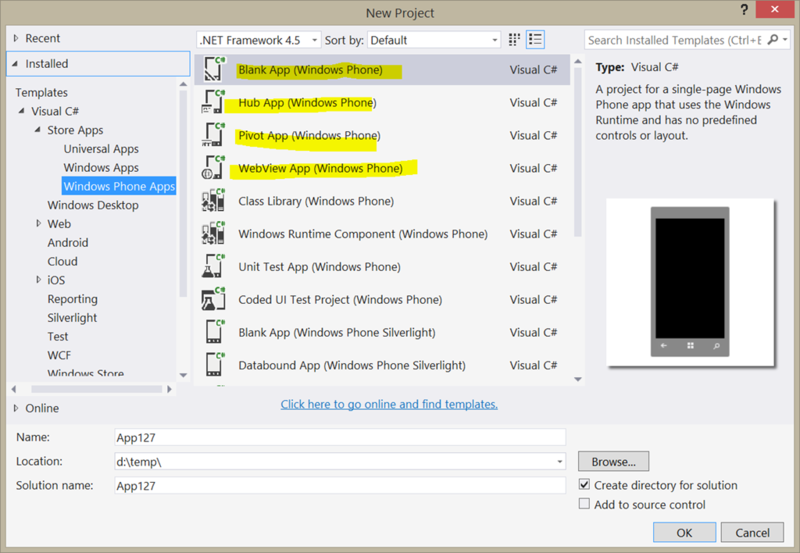 If you’re particularly sharp-eyed then you might notice that the code above is taken from my Windows Phone project and the way in which you can spot that is that the Windows Phone project template adds an additional call to set the Frame.CacheSize property to a value of 1. It also adds transition animations. There would be less code in the Windows code but the difference is fairly small. I don’t think the specifics of the string used by this method are specified anywhere but if the Frame has navigated Page1->Page2->Page3 then the string will include that information and, because a navigation call can take an optional single object parameter that parameter also needs to be represented in this string which puts a requirement on those parameters to be able to be serialized into a string. then unless the entire information needed by the pages can be reconstructed purely from the navigation parameters we will have lost information. 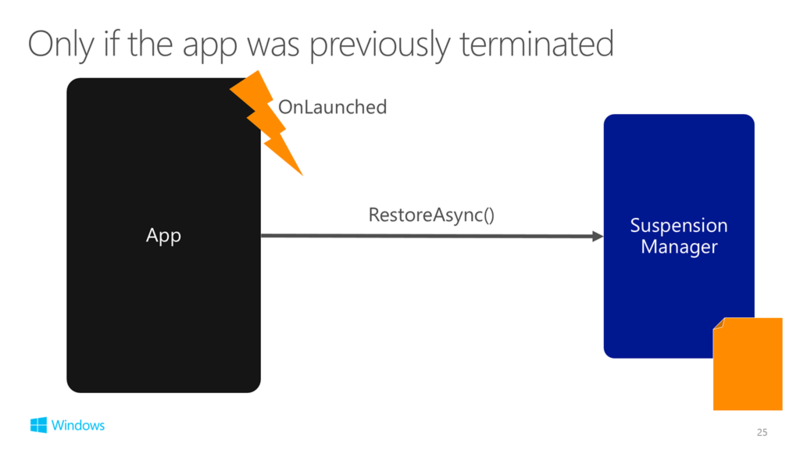 This becomes important when an app is terminated by the OS and has to restore itself at a later point. 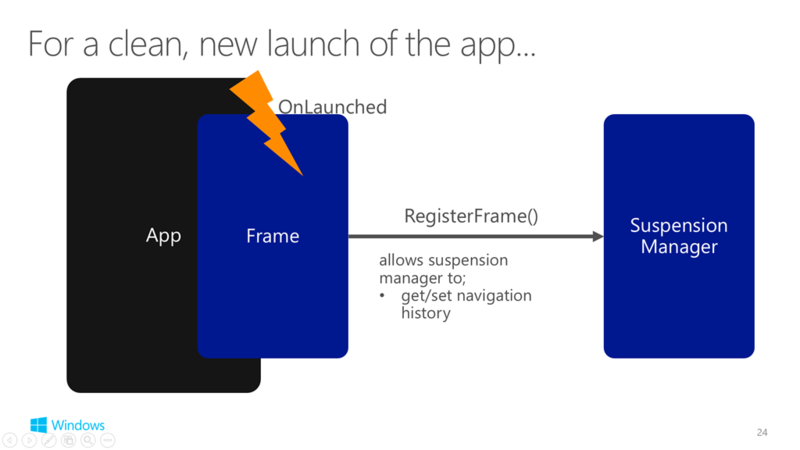 // MT: Register the Frame with the SuspensionManager. What does the SuspensionManager actually do with this Frame? It effectively adds it onto a list such that it can get back to it at a later point in time. Having introduced the Frame to the SuspensionManager we can ask that SuspensionManager to attempt to restore the Frame back to a state which it was in at the point where the operating system chose to terminate the application without the user’s knowledge as part of the regular suspend/resume/terminate application lifecycle management that it performs. 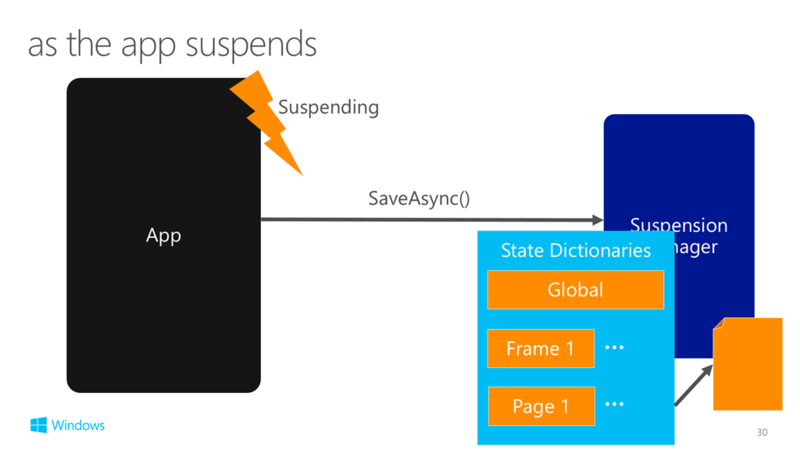 This call ends up being async because the SuspensionManager stores its state to disk so it’s going to be an async call on WinRT to get that state back. By making this call, one of the things we’re asking the SuspensionManager to do is to attempt to load from disk any Frame navigation history that it has stored and to put it back onto the right Frame via the SetNavigationState method on the Frame. Note that your application may want to make a choice about whether to restore state or not depending on how recently that state was saved – e.g. if the app was terminated a long time ago it may not make sense to attempt to restore the user back to their previous state as they may well not remember it and the behaviour could appear random. With the code as it stands though, nothing in my two applications would cause the SuspensionManager to ever save anything to disk and so I need to make sure that happens. 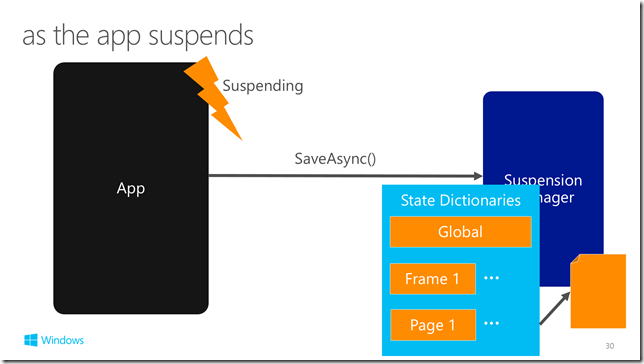 Whenever the app is suspended, the SuspensionManager needs to save state such that it can get it back for the case where the app needs to restore itself after a termination. This is easy enough from a code perspective – I can edit the Application.OnSuspending handler that the templates give me to ask the SuspensionManager to save its state to disk. and as the diagram above indicates, the SuspensionManager is managing a global set of state which is accessed via SuspensionManager.SessionState. Within that state, there’s effectively a dictionary of state for each Frame and within that state there’s effectively a dictionary of state for each Page which gets created by the NavigationHelper class but we haven’t got to that just yet. To see where I’ve got to so far, I thought I’d add some pages to my application and so I modified MainPage.xaml and then added a SecondPage.xaml and ThirdPage.xaml as below. 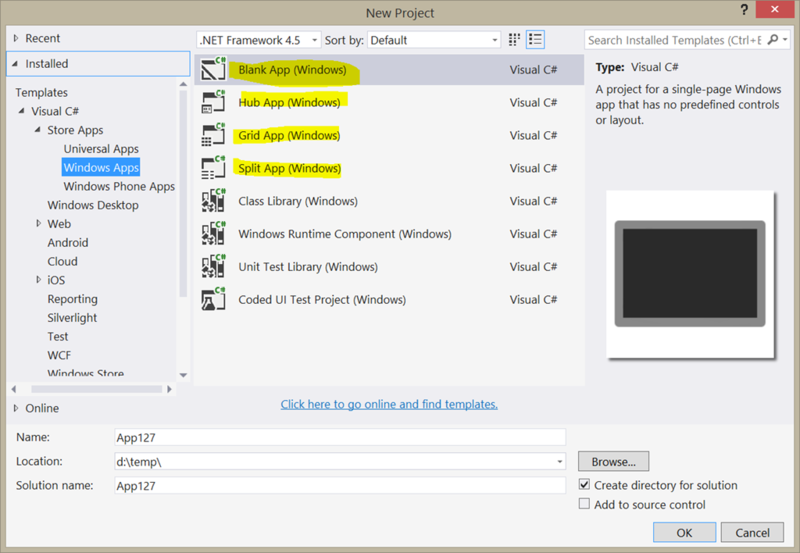 What I didn’t do was just copy the code/XAML for the pages between the 2 projects. In each case, I used the “Add New Item…” dialog. I did that because I was convinced that the templated item for a “Basic Page” was different between Windows/Phone 8.1 and, specifically, I thought that the page template for Windows Phone 8.1 set the Page.NavigationCacheMode to a value of Required but it looks like that has changed between the release candidate of Visual Studio 2013 Update 2 and the final version. You will still find places in the templates (e.g. 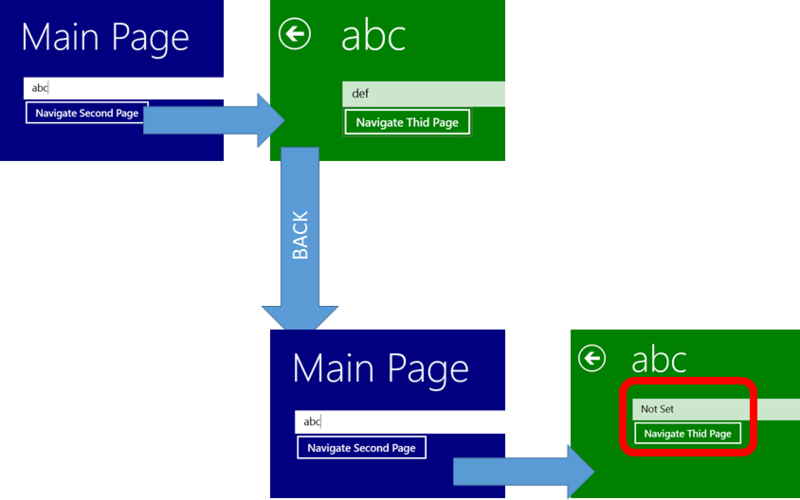 in the Hub project template) where pages are setting that value and I’ll mention it a little later. 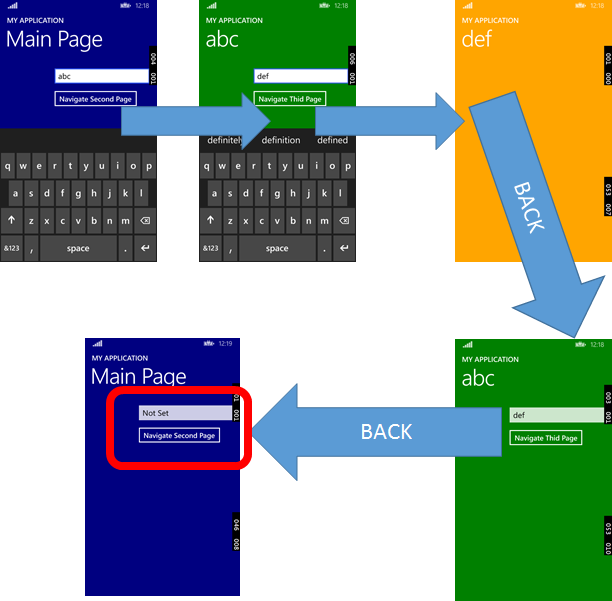 I’ll not paste all of the Windows Phone XAML into the blog post – it’s the same XAML/code but with the “Back” buttons removed as the phone doesn’t need a soft back-button displayed by an app like this. Clearly, on navigating back here from page 3 to page 2 the state that was present in the TextBox has been lost and while the screenshots come from Windows 8.1, it’s the same story on the Phone. 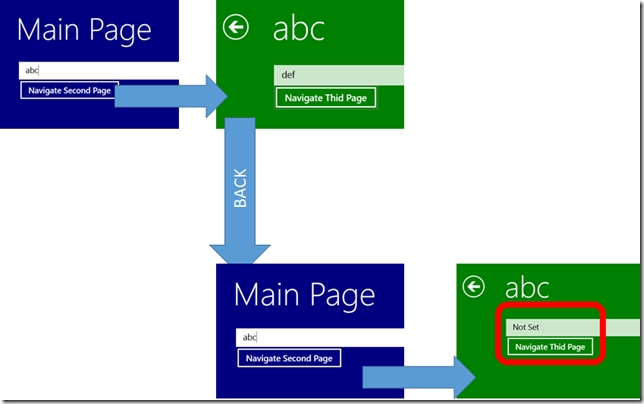 Creates an instance of NavigationHelper for the Page and makes it available via the NavigationHelper property. The creation passes the Page so that the helper can handle the Page.Loaded event and so that it can also get hold of the Frame. Overrides Page.OnNavigatedTo and OnNavigatedFrom and calls NavigationHelper.OnNavigatedTo/NavigationHelper.OnNavigatedFrom. Surfaces the instance of NavigationHelper as a property named NavigationHelper and data-binds to that property from the Back button that it creates in the XAML. GoForwardCommand/GoBackCommand properties serving up ICommand implementations which can then be bound to from the UI and the XAML. A handler for the phone’s hardware Back button such that the button will cause the Frame to check its backstack. If the Frame can navigate backwards then it will do so and it will tell the OS that it has handled the Back event. Otherwise, the OS will perform its default behaviour and will navigate out of the app (this is the default behaviour on Windows Phone 8.1). 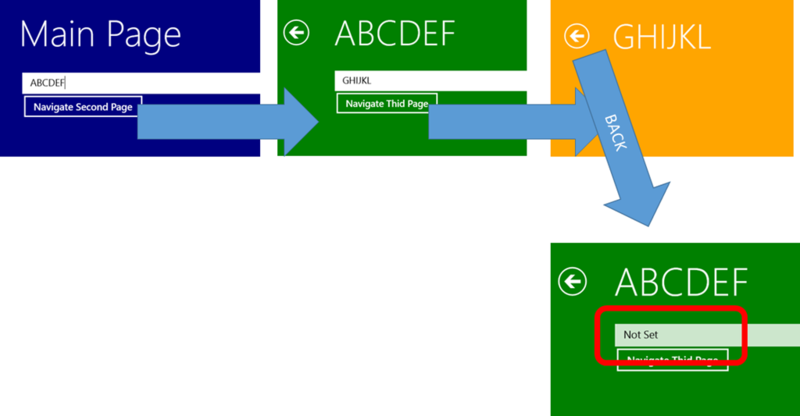 The other aspect of the NavigationHelper is the work it does in its OnNavigatedTo/OnNavigatedFrom methods. What’s done here is effectively to fire LoadState/SaveState events in response to the Page being navigated to/from ( which the template sets the Page up to handle ). I find this pattern a little odd. We navigate to the Page. The Page handles OnNavigatedTo and calls NavigationHandler.OnNavigatedTo which in turn fires a LoadState event back into the Page. It feels a bit circular to me but that’s how it works. The SaveState event is a simpler one. 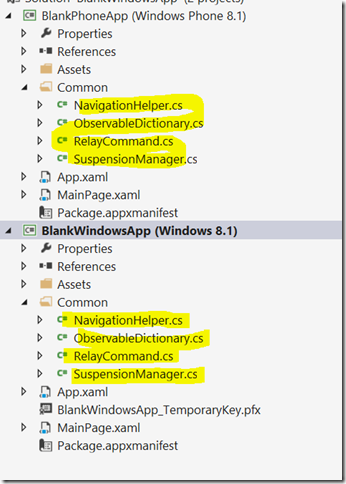 The NavigationHelper makes a new state dictionary, passes it into the SaveState handler for the Page to save its state and then simply adds it to the state dictionary that the SuspensionManager is keeping for the Frame using a key which is based on the depth of the navigation stack (given that only one page can be at a particular depth in the navigation stack). So, as a page is being “left” it has an opportunity to write out any state that it might need to reconstruct itself in the future. The LoadState event is a bit more complex but, fundamentally, a handler is passed a dictionary of state to restore itself from along with the navigation parameter which could be null. That dictionary is obtained from the SuspensionManager’s state for the Frame and if the dictionary is not null then it should be used to restore state. The NavigationHelper attempts to make sure that it passes null or the appropriate dictionary to match the navigation scenario. So, in order to deal with the problem of my code not working right now I’m going to need to change my LoadState/SaveState handlers in the 2 pages I have which build up transient state which is my MainPage and my SecondPage. Before I go there though, I want to take a detour. If I now run the Windows 8.1 application it works “correctly” or, at least, seems to. By switching on page caching and having a Frame.CacheSize set to 1 on the Phone, I’m hitting a problem because I’m relying on the Pages all staying in memory which they don’t. One thing I could try and do is to change my use of NavigationCacheMode.Enabled to NavigationCacheMode.Required or I could manipulate the value of Frame.CacheSize to try and make sure that I cache all my pages. It’s worth repeating that the template code that Visual Studio gave me for Windows 8.1 isn’t setting Frame.CacheSize at all whereas the Windows Phone 8.1 is setting it to a value of 1. If the device doesn’t have the memory for the cache, I guess I’m going to fail. If the application was suspended/terminated/re-run I’m going to fail. Enter text on page 1. Enter text on page 2. Suspend/Terminate the app using the debugger. Then what happens is that I’ll land back on page 3 and I can correctly navigate back to page 2 and then page 1 but neither of those pages will display the right text in their textboxes because all that has been saved/restored by the SuspensionManager is going to be the navigation history, not the page state. Doing the “right thing” in response to the NavigationHelper.Load/SaveState events is going to solve both the problem around a page losing its state as it is navigated to/from and also in the case where the application is suspended/terminated/re-run. and that all works as would be expected both from the point of view of navigating backwards and forwards and also from the point of view of suspend/terminate/re-run. There is one point I’d like to add though around “forward” navigation. Enter state “abc” on main page. Navigate to second page with parameter “abc”. Enter state “def” on second page. State is correctly displayed “abc” on second main page. State on second page is “Not Set” rather than the “def” from step 3 above. Navigating to a page with a parameter via Navigate(Type, Parameter) which is being treated as a “new” naveigation to a page and the page is not being asked to load its state from any previous state dictionaries. 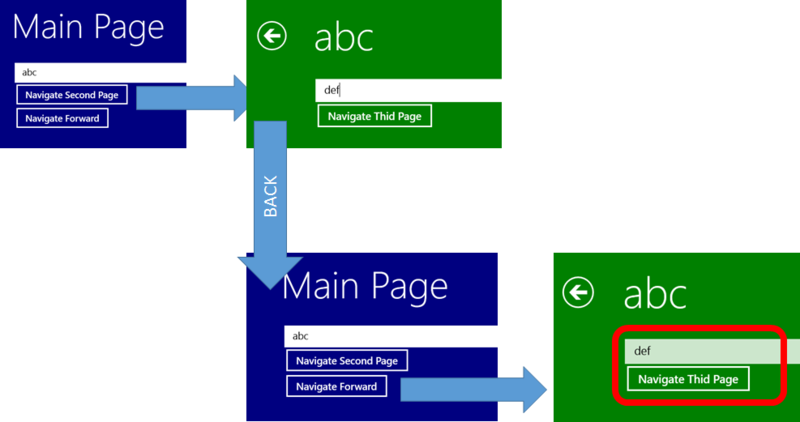 Navigation to a page via going “Forwards” where the page is being asked to load its state from previous state dictionaries. One other thing that puzzled me the first time I dug into this set of classes and the way that they work is this scenario. User enters state onto a page. User switches to another app. Now…at some point the OS is going to suspend that app (on the Phone it happens very quickly, on Windows it takes around 10 seconds). After then, the OS may terminate the app. But…the NavigationHelper hooks into the Page.OnNavigatedFrom handler. That handler does not get called as the user moves away from the app at step 3 above and so any state that had been built up at stage 2 would be lost? as part of calling Frame.GetNavigationState() there’s a call made to OnNavigatedFrom and so the state is grabbed from the Page if it has any. 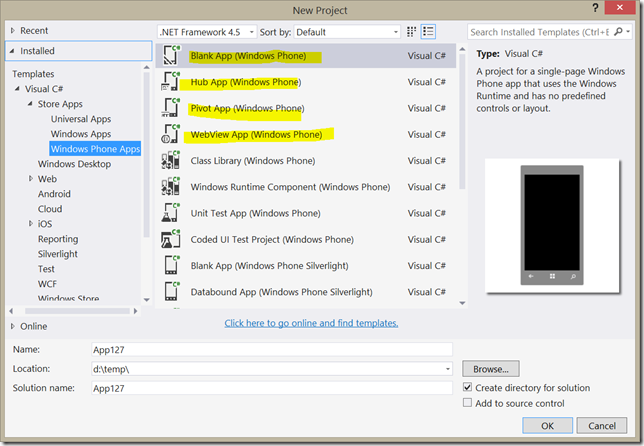 Windows/Phone 8.1 and XAML Apps–Making It Easier for MVVM Developers?